Therapeutic antibodies are now the major class of successful protein drugs with many more in development to target a variety of major diseases. An important and desirable biological activity of most antibody drugs, especially for oncology targets, is antibody-dependent cell-mediated cytotoxicity (ADCC). In ADCC, circulating natural killer (NK) cells perform lytic killing of antigen-bearing target cells through specific antibody cross-linking of the two cell types. Several signaling pathways are activated in the NK effector cells as a result of multiple FcγRIIIa receptors being engaged by the target cell-bound antibodies. These lead to lysis of target cells and induction of specific cytokines (e.G., through NFAT, or nuclear factor activator of T-cells) in the effector cells. It is important to quantify the biological activity of any therapeutic antibody in a bioassay during drug development and manufacture. The potency of a manufactured lot is quantified relative to a reference preparation in a lot-release potency bioassay, and this bioassay must be both precise and accurate. Assays that use primary NK cells possess large inherent variability because of the significant influence of genetic variability and blood donor health status on the extent of ADCC mediated by these cells. Preparation of primary NK cells is slow and tedious. Non-Ab dependent or spontaneous lysis of cells increases background and decreases the dynamic antibody-specific signal range. Extra controls are required to subtract spontaneous lysis from both effector and target cells. Much current antibody drug development is aimed at establishing new drugs with improved Fc effector function to better address a larger percentage of patients. Accurate and precise quantification of the biological activity of candidate drugs is needed to advance the best candidates through drug development effectively. But this is difficult with current classic ADCC bioassay formats, where inherent variability limits their use in both developmental stages of assessment and manufactured lot-release potency bioassays. The biologics industry needs better assays, bioassays that can both quantify Fc effector function and that possess less inherent variability and greater ease of use and convenience. Promega’s reporter-based ADCC bioassay is a new cell-based genetic reporter assay that uses an engineered Jurkat cell line as the effector cell population, avoiding the requirement of purified NK cells from blood donors and avoiding the variability in effector function. We have exploited activation of the NFAT signaling pathway, which is intact in Jurkat cells and is activated in NK cells upon cross linking of FcγRIIIa receptor with target cell-bound specific antibody. A robust and sensitive luciferase bioluminescence signal generated upon pathway activation delivers good signal to background (fold induction). We also engineered the same Jurkat cell line to co-express the FcγRIIIa receptor (high affinity variant), thus completing the engineering needed to generate an effector cell line able to quantify Fc effector function of therapeutic antibodies in ADCC. Assay protocol is simple, robust, and convenient. The Promega reporter-based ADCC bioassay is shown in Figure 1. 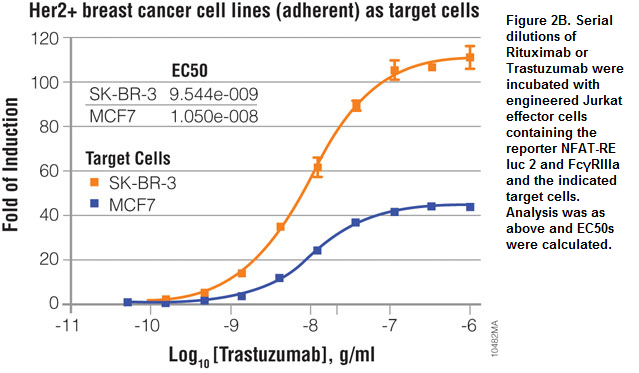 In our ADCC reporter bioassay, effector cells are essentially assay reagents. 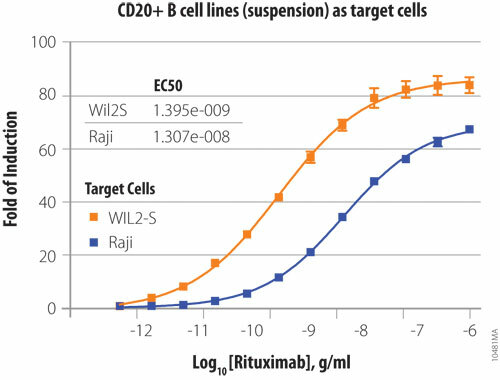 The Jurkat effector cells are provided in frozen, thaw-and-use format. They are prepared under stringently controlled conditions for use after thawing directly in the bioassay, without further culture. Ample cell banks enable consistent supply and consistent results. With the improved assay design and procedure, and cells as reagents, the new reporter-based bioassay format outperforms classic ADCC in many key parameters: Low variability, improved accuracy and precision, ease of assay procedure, and low background (sensitivity). To demonstrate the ability of the reporter bioassay to quantify Fc effector biological activity of therapeutic antibodies, several on-market antibody drugs were evaluated in the assay. When the anti-CD20 drug Rituximab is assayed using the engineered Jurkat effector cells and CD20+ WIL2-S B cells, clear dose-responsiveness is evident, but when any essential component is absent or replaced with a nonrelevant alternative, e.G., Trastuzumab, no signal is obtained, demonstrating assay specificity (Figure 2A). 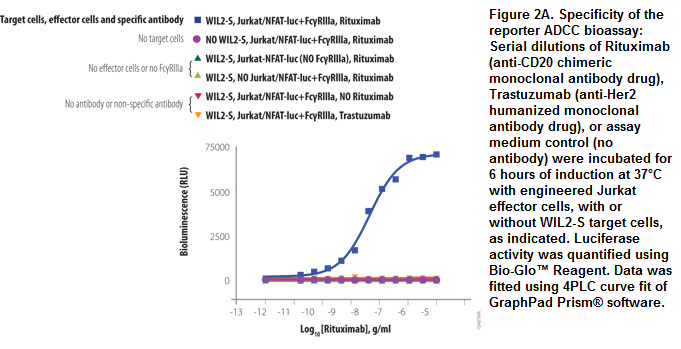 The bioassay is effective at quantifying not only biological activity of the therapeutic antibody Rituximab using suspension CD20+ B cell lines as target cells (WIL2-S and Raji) but also biological activity of the therapeutic antibody Trastuzumab using adherent Her2+ cell lines as target cells (SK-BR-3 and MCF7) (Figure 2B). 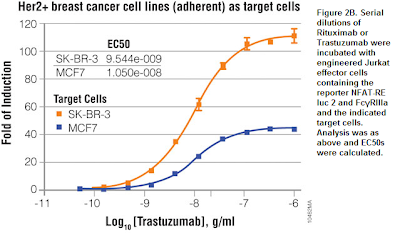 Using several additional, different biological systems of target cells and antibodies, similar results obtained by alpha testers of this bioassay in the U.S., Europe, and Asia support the “validity” of this bioassay in quantifying the efficiency of Fc effector function in ADCC. N-glycosylation of Fc region of antibodies is essential for ADCC. 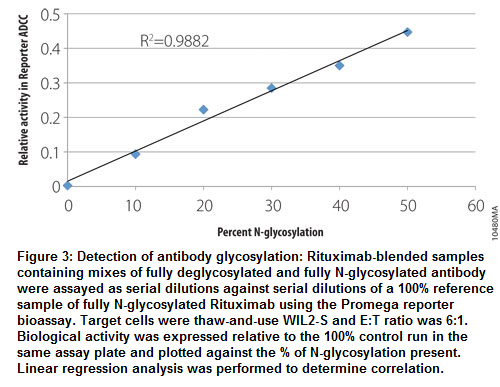 To evaluate the reporter bioassay’s sensitivity to different antibodies with different levels of glycosylation and thus ADCC efficiency, Rituximab was fully deglycosylated using PNGase F. Then blends of N-glycosylated and deglycosylated samples were prepared and assayed in the reporter bioassay (Figure 3). Good sensitivity of the bioassay in differentiating antibodies with small differences in glycosylation is demonstrated by the good linear correlation between the % N-glycosylation and relative activity in the reporter ADCC bioassay compared with fully N-glycosylated antibody. Bioassay qualification was performed to evaluate critical performance parameters across a suitable antibody potency range in a potency bioassay. The bioassay demonstrates good linearity, accuracy, precision, and reproducibility from qualification assays run at four different test antibody potencies (range 50-150%) relative to 100% reference sample across three different assay days (data not shown).